By default, the Synonym Editor opens to the last view used. Right-click the synonym or segment name, select Data Profiling, and then Statistics. For alphanumeric columns, the Statistics report provides the segment, format, count of distinct values, total count, patterns count, maximum, minimum, and average length, minimum and maximum values, and number of nulls. For numeric columns, the Statistics report provides the segment, format, count of distinct values, total count, maximum, minimum, and average values, and number of nulls. Patterns. Only available for alphanumeric columns, shows patterns of letters, digits, and special characters, as well as counts and their percents. Values Pie Graph. Displays a pie graph for alphanumeric field types. 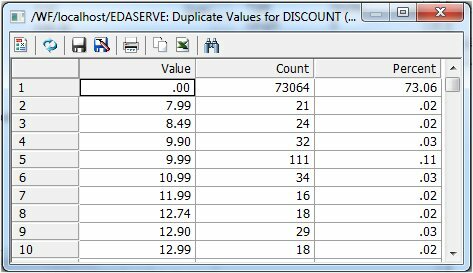 Duplicate Values. Shows identical values and their percents. These reports are available by right-clicking a column in the Synonym Editor and selecting Data Profiling. Right-click a column, select Data Profiling, and then Statistics. 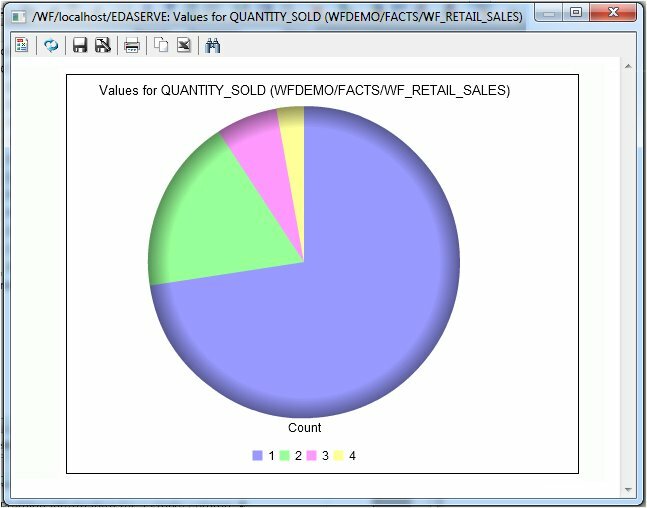 The Statistical Data Profiling information opens in the workspace, as shown in the following image. Data Profile Patterns shows patterns of letters, digits, and special characters, as well as counts. This is only available for alphanumeric columns. 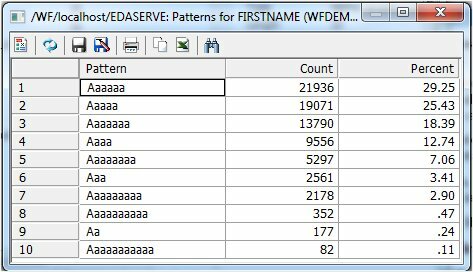 Right-click a column, select Data Profiling, and then Patterns. The Patterns Data Profiling information displays, as shown in the following image. Right-click a column, select Data Profiling, and then Values. The Values Data Profiling information displays, as shown in the following image. 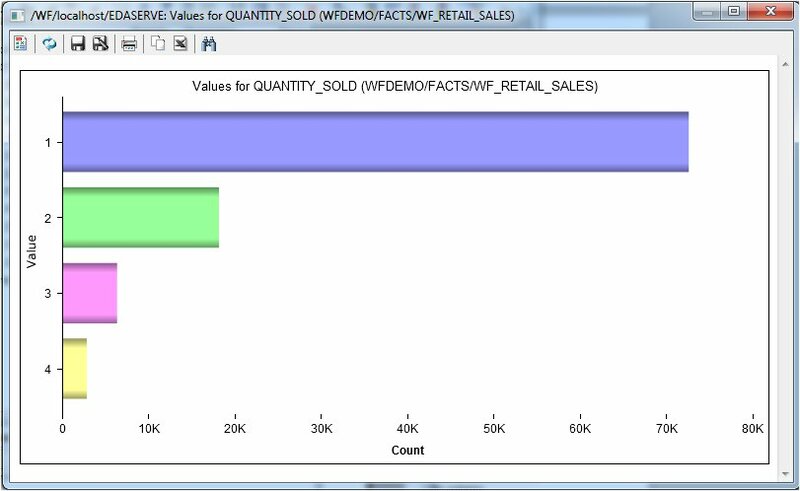 The Data Profile Values Graph displays values as a bar graph. Right-click a column, select Data Profiling, and then Values Graph. The Values Graph Data Profiling information displays, as shown in the following image. The Data Profile Values Pie Graph displays values as a pie graph. Right-click a column, select Data Profiling, and then Values Pie Graph. The Values Pie Graph Data Profiling information displays, as shown in the following image. 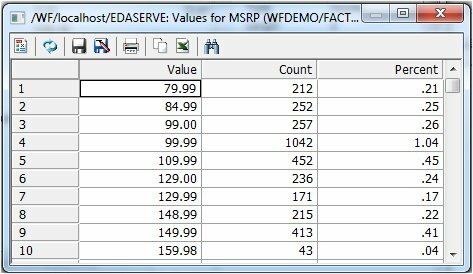 Right-click a column, select Data Profiling, and then Duplicate Values. The Duplicate Values Data Profiling information displays, as shown in the following image. 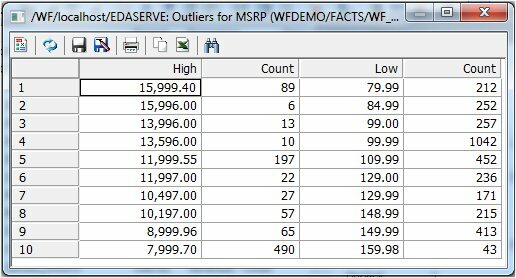 Data Profile Outliers shows the ten highest and ten lowest distinct values. Right-click a column, select Data Profiling, and then Outliers. The Outliers Data Profiling information displays, as shown in the following image. Note: Outliers produce a maximum of the ten highest and ten lowest distinct values, if they exist.